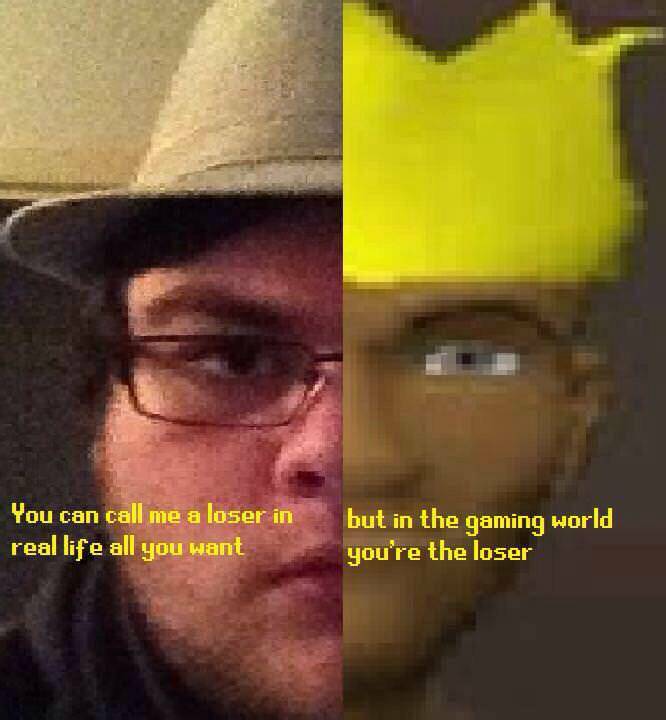 Do you talk about RS IRL? really depends, ill tell my nurd friends at work but that's about it. I don’t really talk about RS in real life. Most of my friends were never into RS, so I don’t feel like bothering them with my stories. But if they’d ask about it, I’d be completely honest. Playing RS is nothing to be ashamed of. Occasionally when I'm with my old matess we will chat about the things we got up to on it, double clanning, scamming, wars we were in, it's always an enjoyable funny conversation. Edited by jamie macd, 05 August 2018 - 3:51 PM. I mention it occasionally. I used to have a few real-life friends that play the game, but either we grew apart or they quit. It doesn't really come up much anymore but I'm not too active anymore. Mostly what comes up are facebook friends asking who that foreign name is commenting on my posts as I've always gravitated more towards gmt based clans over est. Me: It's a game I used to play a lot. Me: Multiplayer adventure game ... playable on the computer. Them: Is it like PUBG? What do you have to do? Me: PUBG? (insert Jackie Chan mindfux meme) erm...no. Well, in RuneScape you can kill monsters and do story-based missions. Them: Yeah, no, (higher pitched voice) not boring at all. So, you got paid to play this game? Them: So? What did you get? Me: Nothing. Let's change the subject. Tell me again about the massive rubber phone case you just bought for a phone you purchased specifically for being 0.1 mm thinner than the previous version. Had a hilarious lunch break at my brand new workplace when me and some of the other guys were chatting about video games for the discussion to then turn to RuneScape. Cue all the nostalgic memory sharing, trying to work out how we got so addicted (one started doing the old pickaxe animation saying "mining was literally watching your character do this"), and etc. The same person then went "God, imagine if you still played it." Which got a nervous round of "yeah, man, imagine..." from the rest of us. Even now I have no idea how I didn't crack up at the immediate change in mood and silence. Was so obvious they still did or wanted to if they had the time, haha. He actually sent me a WhatsApp message a few days back being blown away at the prospect of OSRS on mobiles, don't actually know how he just found out but whatever, so if I don't come across him playing in the office I'll genuinely be shocked. There has not been a moment where I've felt unsure about my social capabilities, that is to say if we are discussing about habits, I've always included my RuneScape account into the conversation and the 300 days I spent playing the game. This has not been an issue because I've excelled in other video games like CoD and FIFA as well. Putting people to shame has been an overachieving section for me. Ask not what your country [clan] can do for you, but what you can do for your country [clan]. All my friends know I still play Runescape and it's an amazingly effective vehicle for self-deprecating jokes. You guys have no idea. "Listen guys I have a maxed out runescape account, do you think I have a life?" Honestly, I remember when I was young and kinda would be shy about it. The school I went to wasn't really into video games like others in the area I've noticed, but as I've gotten older, it seems more people played it than I thought. I catch myself talking about it here or there. As a young teen I hid it from everyone, hell I'd go as far as to tell my girlfriend I was playing football with they boys, and tell the boys I was with my girlfriend. As a young adult I dont even attempt to lie about it. Even found out three guys in my fraternity play still secretly hahahah. There is a time and place to talk about rs and it usually happens during long defense missions on Warframe or bringing back memories on facebook with some old clan buddies I got added. No shame! Your signature has been removed because it was breaking the rules of this community. It was too big (either too wide or too tall) and/or its file-size was too large. To find out more, please see our Help & Rules Section. Please ensure that you fix your signature according to the rules before putting it up again. Otherwise, you may be banned. If you need any help, feel free to contact me.